Our retail point of sale and restaurant point of sale systems, rated #1 two years in a row by Hospitality Technology Magazine, provide cost saving capabilities far beyond what you can expect from a conventional electronic cash register or generic pos system. We are experts at helping you improve profitability by increasing efficiency, accuracy, and reducing inventory loss. With over 20 years in the point of sale industry, REBTEK and PcAmerica pos software is used by over 50,000 users worldwide. Our pos software engineers continually return to the field to learn from our customer's operations. This enables us to offer pos systems that are feature rich, yet affordable and meet the actual needs of your retail or restaurant business. Restaurant Pro Express (RPE) is a touch screen restaurant point of sale (POS) system that provides fast operation, accurate order taking and detailed reports with an easy-to-use interface. Table service and fine dining restaurants, fast food establishments, coffee shops, pizza parlors, cafeterias and all other types of restaurants will find the features they need within Restaurant Pro Express. pcAmerica's restaurant point of sale software has dozens of features in a package that is easy and affordable enough for independent restaurants and capable of sharing data between multiple restaurants. The Restaurant Pro Express solution is scalable for many types of restaurants, single or multi-site. Restaurant Pro Express is the easiest restaurant POS system available. Train your servers in as little as 60 seconds to place orders and close out checks. The colorful touch-screen interface walks servers through each transaction, helping them place each order quickly and accurately. The POS responds how you think it will respond -- a factor that helped us win the # 1 spot for Ease of Use in the Hospitality Technology Magazine POS Scoreboard. Fast order entry is critical in all types of restaurants. Quick service restaurants will see lines moving faster, resulting in happier customers and higher volume. Servers at table service and fine dining restaurants will spend less time inputting orders and more time helping your guests. Every second saved helps boost your profits. The Restaurant Pro Express point of sale system is designed to speed up the operations in your restaurant. The kitchen is the busiest area in most restaurants. Errors in preparation can cost precious time, money and customer loyalty. Restaurant Pro Express prints orders clearly in the kitchen. Orders sent to the kitchen printer include each item ordered, the modifiers on the item (printed in red), an optional guest number and name on a large, easy to read printout that includes a unique order number, order time and name of the server. 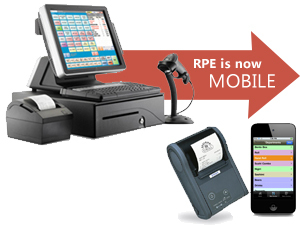 Faster paced, more demanding environments use RPE and a kitchen display system to speed service and enhance productivity by routing orders to the proper preparation areas, flagging tardy orders and displaying items as they are rung into the register. The detailed reports built into Restaurant Pro Express provide the numbers you need to help you make smart business decisions. Many restaurant owners know they are making money but don't have an accurate picture of how much profit they make or what factors of their business they can alter to increase that profit. Comprehensive sales reports help you determine how much money you're making. Reports that list your best and worst selling menu items, combined with a shopping List report that estimates ingredient usage based on the food ordered through your POS, will help you reduce your ingredient costs 1-5%. Labor per dollar hour comparison reports, tied to the built-in time clock, help you avoid costly overstaffing by analyzing how many dollars you earn per employee hour. Cash Register Express (CRE) is a retail point of sale (POS) system that helps increase efficiency and accuracy, lower operating costs, and helps you manage your inventory. The easy to use POS includes the features most desired by retailers, such as inventory tracking, credit card processing, cash management, customer loyalty, employee time clock and labor scheduling, and a detailed reporting interface to help them make smarter business decisions. 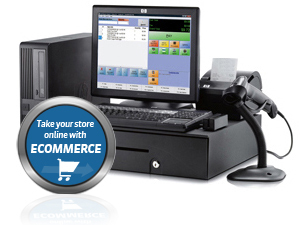 The Cash Register Express POS solution is scalable for many types of retail stores, single or multi-site. Retailers benefit from a POS system that is easy to use and enables cashiers to ring up sales fast so the lines stay short. Ringing up an item is as simple as scanning its bar code, or touching its button of a touch screen if it does not have a bar code. Sale and specialty pricing are automatically calculated by the POS. Cash Register Express is designed to require the least amount of touches necessary to ring up a customer, and performs faster than a traditional cash register. Quick tender keys make cash transactions fast, and payment by credit card and gift card is as simple as swiping the card -- no buttons required. Payment by other tender types such as pin debit, EBT and checks are also supported. Accurate and robust inventory control is a key component of a retail store’s profit margins and overall success. The inventory tracking capabilities within Cash Register Express detail which products are selling, what needs to be reordered and identifies items that have been stolen or are otherwise missing. The integrated purchasing functionality is used to track vendor lists, manage item costs and generate and receive purchase orders. Stock can be counted or received away from the register using the integrated Pocket Inventory software on a handheld computer. Good service and quality products are key components of generating new and repeat business, however, those two elements alone will not ensure success. Cash Register Express helps you answer the question of ‘What next?’ after selling to a customer. Solid marketing and a loyalty rewards program are proven methods of attracting new and existing customers into your store. The system puts several tools in your hands to help you accomplish this including automated tracking of loyalty plans and tools to market directly to your customers. Employee theft is one of the leading causes of retail shrink, caused by a combination of theft of cash and inventory, as well as unwarranted discounts. 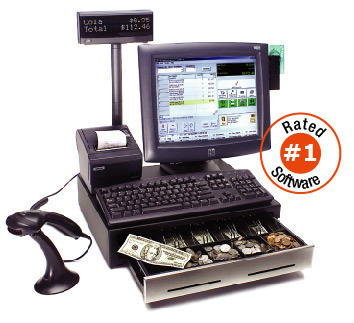 Cash Register Express includes multiple theft prevention features that introduce accountability to your employees. System functions such as discounts, no-sales, voids, and price changes can be accessed or restricted based on an employee’s unique login ID or job code. Various reports can be generated on this activity to identify potential theft or wrongdoing. Strict cash control features can be used to identify cash discrepancies down to the shift or the cashier. A camera security system can be connected to your point of sale system to further enhance the accountability of your employees and security of your store. Retailers spend countless hours calculating profits, expenses and payroll and performing a variety of manual tasks in order to run their business. Cash Register Express contains dozens of built-in tools to help retailers streamline administrative tasks and manage their retail stores more efficiently. Labor is typically the largest expense in a retail store outside the cost of the products being sold. Cash Register Express has integrated time-clock and labor scheduling functionality to help you manage staffing and reduce labor costs.